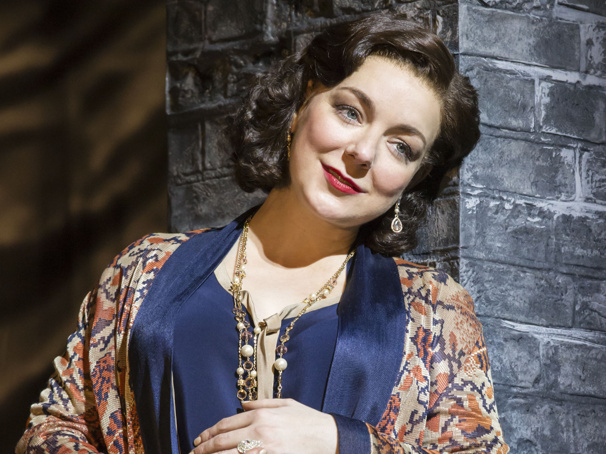 Sheridan Smith in "Funny Girl"
Following the announcement of screenings around the United Kingdom, Trafalgar Releasing has announced that London's Funny Girl starring Olivier winner Sheridan Smith will be broadcast in cinemas globally on October 24. Tony winner Michael Mayer's production was filmed by Digital Theatre during the final week of its run at the Manchester Palace Theatre. Funny Girl follows Brice (played by Smith), who rose from the Lower East Side of New York to become one of Broadway's biggest stars under producer Florenz Ziegfield. While she was cheered onstage as a great comedian, offstage she faced a doomed relationship with the man she loved. Jule Styne and Bob Merrill's now-classic score features songs such as "People," "You Are Woman, I Am Man" and "Don't Rain on My Parade." Mayer's acclaimed production featured choreography by Lynne Page and a revised book by Tony winner Harvey Fierstein (adapted from Isobel Lennart's original). In addition to Smith, the cast includes Darius Campbell as Nick Arnstein, Nigel Barber as Florenz Ziegfeld, Zoë Ann Bown as Mrs. Meeker, Martin Callaghan as Mr. Keeney, Jennifer Harding as Emma, Rachel Izen as Mrs. Brice, Joshua Lay as Eddie and Myra Sands as Mrs. Strakosh, with Rhianne Alleyne, Kit Benjamin, Lloyd Davies, Flora Dawson, Joseph Dockree, Abigayle Honeywill, Brontë Lavine, David Mcintosh, Peter Nash, Gillian Parkhouse, Tom Partridge, Nova Skipp, Alexandra Waite-Roberts, Sam Wingfield and Alexandra Wright. For cinema locations, click here. Check out the first theatrical trailer below.